First, take a good look at our collection and choose a design you love. If you have something specific in mind, just contact our design team and you will get a personalized design or one especially created for you. We can fit any design on any wall. 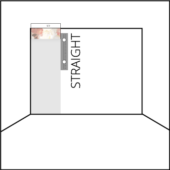 All you have to do is measure the wall and fill in its height and width below. For more info, check the “Measurements” section. 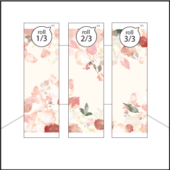 Now you can choose the piece of wallpaper that will actually be installed on your wall. This step will help you get an accurate preview of the product you will receive. 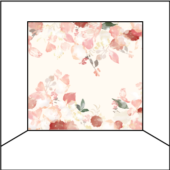 Put the cropping tool right on the pattern you want on your wall. If you need help with any step just contact our customer support team. Once you have the preview image, just place your order and you’re done. Once you settle the payment, our production team is ready to work on your product. Then your Accent Wall is carefully packaged and safe to be delivered. For more information about delivery costs and timing check our “Delivery” section. We will send you the mural in stripes, cut to fit your wall and easy to install by your decorator. For details and practical tips, check the “Installation Steps” section. In order to create the perfect Accent Wall for you, we need the exact width and height of the wall you want to decorate. Before production, we zoom your Accent Wall by 1 or 2%, just to cover any measurement error, caused by a curved wall, for example. If you want to skip this step, just let us know that you don’t want us to zoom it when you place the order. You can see some sketches below that will help you work out the best method to measure your wall. If you need any assistance, feel free to contact our customer support team. 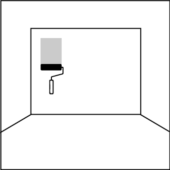 Please avoid doors, windows or electric plug-ins, as they will be cut away during installation. If you would like to see a mock up of how the Accent Wall will be integrated with the obstacles, just send us detailed measurements and the exact situation so that we can help you with the best solution. Be sure to measure the longest and widest parts, adding every bump. To avoid errors we print the mural as a whole rectangle so that you can cut away the slope during installation. 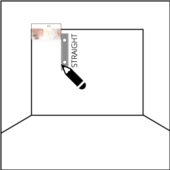 When measuring a wall with 2 slants be careful to identify and give us the longest part in both width and length, as shown below. Accent Wallpaper is really a breeze to install, however, we recommend that you hire a professional to do it, for best results. The mural is applied to the wall with a powerful glue, with special non-woven paste. Make sure the wall is clean and dry, with no holes, wallpaper debris or other bumps on it. If necessary, polish away any hindrances that might be visible after hanging the mural. Wipe the surface with a soft, barely wet towel. Wait for the surface to dry completely before applying the mural. 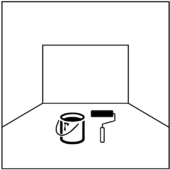 We recommended that you apply a thin layer of primer beforehand, especially on porous surfaces. 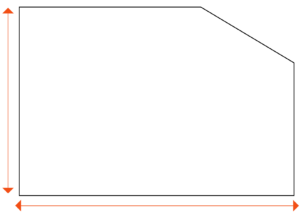 You will receive the mural in stripes of 1.1 m width, long from floor to ceiling, marked from left to right, on the upper side, with numbers starting from 1. Identify the mural stripes in the right order and match the complete image. Now they are ready to be glued together. 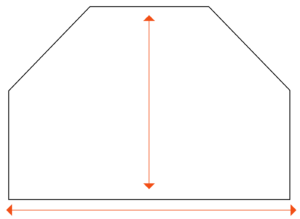 To be able to fix the first stripe perfectly vertical, make sure you draw a straight line on the wall beforehand, using a level. Use a strong adhesive, a paste for unwoven fabrics and follow the preparation instructions on the pack. Apply the glue directly to the wall. Glue the first stripe and make sure the wallpaper sticks evenly and is right on spot. After gluing the wallpaper, use the seam roller to get rid of bubbles or any edges. It is very important that the first stripe is applied correctly, as it sets the tone for the next ones. 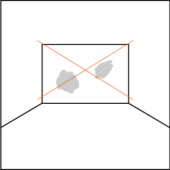 The glue for wallpaper is transparent. In case of leaks or other marks on the wallpaper, they can be easily cleared away with a moist, clean cloth. Start with the next stripe, close to the first one, matching the visual beforehand so that there is perfect continuity. Repeat the steps for every stripe until the wallpaper is complete. Trim the excess paper off using a cutter. Use a special plastic scraper to perfectly cut the wallpaper and then clean it with a moist cloth to remove any residual clay leaks. TA-DA! Your Accent Wall is ready, enjoy! The material we print our wallpaper on has been carefully selected to grant you a good investment. It is unwoven material of premium quality, fast and easy to hang by only pasting the wall with glue. Strong, dimensionally stable and easy to peel if it needs to be replaced. This material can be used for decorating personal spaces as well as open spaces in commercial areas. It is a premium wallpaper and very resistant to dirt. The print has vivid colors and a perfect finish. Once we get your order, our production team starts working on it right away. Then, it will be packaged and shipped within 10 working days from the moment you submit your order. We offer free shipping on orders that are 300 Euro and over. We try our best to make your order ready for shipment within 10 working days from the moment you submit it but the truth is we usually do that even faster. Nevertheless, please remember that this process is sometimes conditioned by external factors that can cause a delayed delivery. You will receive an email as soon as your order is shipped with all the information you need to be able to monitor its course. Please keep in mind that orders placed after 3 PM will be processed the next working day. We take great care to ship your Accent Wall so it arrives in perfect condition. 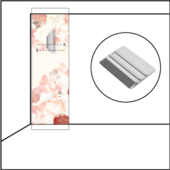 The wallpaper is packaged in a tough cardboard tube with a diameter of 20 cm and 1.2m long. This precaution is not standard use in the market but we prefer to give the product extra protection during delivery, as we guarantee its safe shipment. 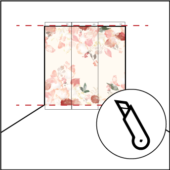 You will find instructions on the wallpaper hanging in the pack but they are also available online. All goods are delivered by post and are insured in case of loss or damage. Should this happen to your package, please mention this on the shipment notification upon delivery, that the delivery man will give you to sign. After notice, we will be able to send you a new product to replace the damaged one as soon as possible. We take our quality vows very seriously and this will surely reflect on your level of satisfaction. But should you find anything wrong with your product, please notify us within 5 working days and we will do our best to solve the problem in the shortest possible time. Also, we will also ask you to send us photographs that reflect the problem via email, at contact@accentwall.eu. 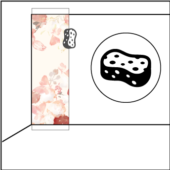 Please also take into account that the wallpaper cannot be returned if it had been already glued to the wall. All our wallpapers are printed and custom made so that it can best fit your wall. 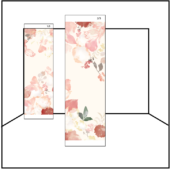 We are not able to do refunds or returns in case you change your mind about your purchase, as the dimensions are custom and the wallpaper can not be sold again. Under any circumstance, we can not cover hanging or installment errors, caused by a third party.